Around the corner on 29th from the Broadway sweatshirt and perfume wholesalers, lies some great spicy South Asian (Pakistani, Indian, Bangladeshi) food at two neighboring restaurants with similar food and prices. One is upstairs with a nicer dining room (although still worn down), while the downstairs one is even shabbier with bright florescent lighting. Of course nicer doesn’t always mean better… and in this case the latter is always more packed and the definitive people’s choice. This is Chandni. I spent the past week here, observing and eating delicious curries. Particularly last Friday, I caught myself dining near the window, when two hundred Muslim men started to pray towards me right outside (There’s a mosque next door). A little awkward, but I’m not sure for who. Then after watching me eat, many of them came inside to enjoy some comforting halal food. It was getting packed. I checked next door and no one was there. Maybe because no one wanted to walk up the stairs? More possibly because Chandni, though shabbier, seems more open, sociable and a place where their customers feel comfortable… much the same as the elderly hanging out at McDonald’s early in the morning. They feel at home. There’s a $6 curry chicken and vegetable lunch special. Good, but for one dollar more you can choose almost anything else –pick one meat and one veg over rice for $7. 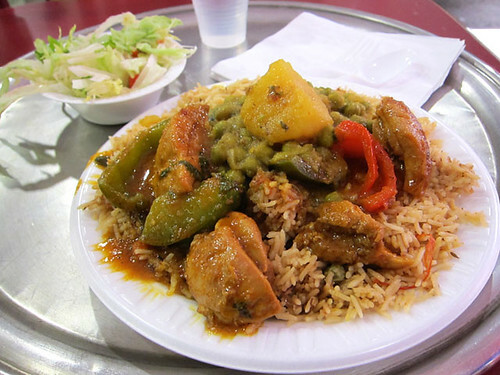 Dishes in the steam trays vary daily, but there’s usually a curry goat or lamb and spicy vegetables with chickpeas, spinach or potatoes. The best platter I’ve had recently was the mushy Bitter Melon and deep-fried Chicken Manchuri. So good, my friends kept picking at my plate. The generous-sized samosas ($1) and chicken rolls ($1.50) are a great addition or snack. The chicken rolls are almost like Chinese spring rolls, but with spiced minced chicken inside. I’m glad a friend recommended this to me. Nice to dip them in their green sauce, which is initially cool with a little heat on the back-end. 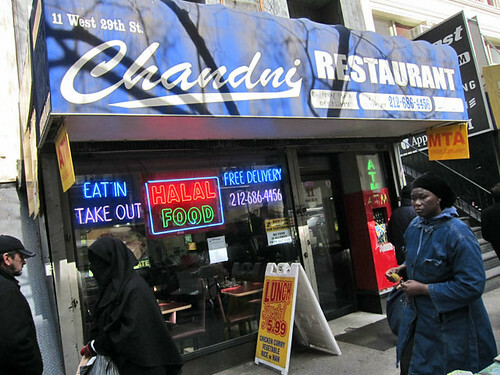 Chandni is a delicious lunch spot for spicy halal food for Muslims and non-Muslims alike. Come before or after the Friday salat (around 1pm) to avoid any awkwardness. Unless you really want to be the jerk to eat directly in front of two hundred praying people or are really really hungry for curry. Didn’t mention this above, but sometimes the female staff can be a little snappy. The guys are cool and friendly. Posted by Jason Lam at 10:00 am, March 12th, 2010 under Flatiron Lunch. now next week im gonna have to find some of those chicken rolls… and try some of that curry… and find a place around me that serves some good tikka masala… damn when will i have time to do work during all of this?! damn you midtown lunch! 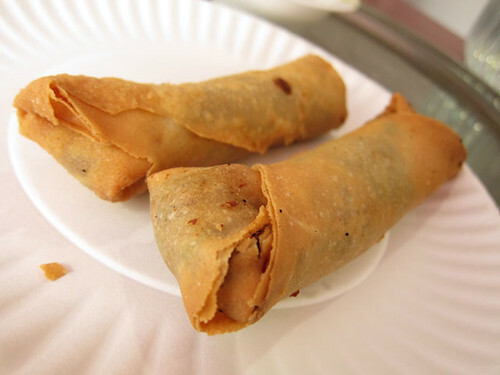 Additional Note: (Just hit me this second) –I think those chicken rolls are actually more like Filipino Lumpia rolls with more meat, but still probably closer to a fried spring roll wrapper. Dang. I hope those ladies don’t spit in my food when they read this. Work right around the corner and this is the first I’m hearing of this! Thanks MTL!! Will try it soon as today was our office Kyochon expedition. There is another place like this on 30th between 5th & Broadway, Punjab Palace. We (coworkers) have been going there since October and have yet to be let down, authentic,overall good place, and worth a try. Im always up for some heat!